Home > What We Do > Research Methods > FAQ > What is a cognitive map? Cognitive mapping is a technique that has been used in disciplines such as psychology and sociology for many years to explore the ‘true’ opinions of research participants. As human beings, we create constructs and attitudes that help us to anticipate our environment, and this is no different in the business environment, as we create these constructs for different brands and services that we might use or receive. A ‘cognitive map’ is not dissimilar to a mind map, though different opinions and perceptions can be linked (Figure 1) to illustrate the associations or connections between each other. As well as measuring the relationships between the associations, the strength of these associations can be mapped. This allows us to suggest which perceptions are most strongly associated with the brand or topic in question. For instance, in Figure 1 the strongest association of ‘reliable’ is signified by the thickness of the connecting line. What can cognitive mapping show us? Cognitive mapping is all about getting to the core of sentiments and beliefs of respondents about brands or products. Through doing this, we can start to develop a good and relatively robust set of attributes which are important for a certain product or brand. For instance, in Figure 1’s example, if we were using cognitive mapping to investigate market research, and each respondent suggested ‘reliable’, we would learn that this is an important aspect for brands in the industry. The level of granularity that can be gathered from using cognitive mapping means that we can develop this robust map in only a handful of interviews (around 8-10), making this technique perfect for b2b markets where there may be a limited pool of experts in the industry. Although historically more widely used in consumer research and the social sciences, there are several avenues in which we can use cognitive mapping in b2b research. 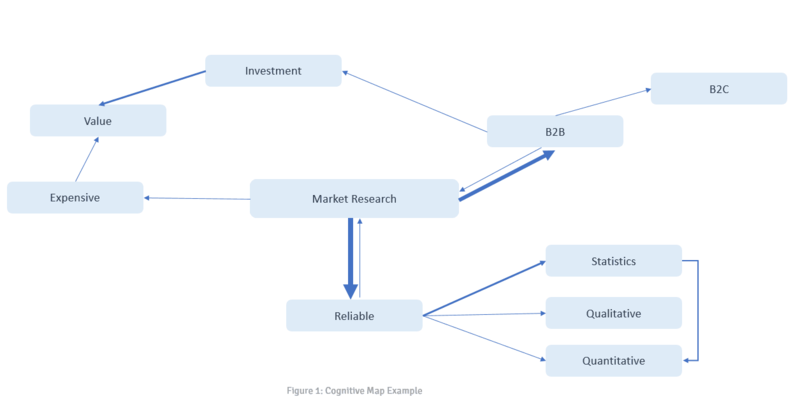 Due to its qualitative nature, cognitive mapping can be useful in the immersion stage of research, when we, as market researchers, look to fully understand the industry that we are investigating. Depth interviews with key stakeholders or industry experts could act as a springboard to gather associations about the industry. Mapping these associations could give us a good steer on what we should ask a wider sample of respondents, or what we should highlight in quantitative results, as we would already have a robust analysis of associations with the product or service. Developing a cognitive map also gives us a clear representation of associations from qualitative research, as it is simple to see which associations are most strongly linked with the brand or service, which have a two-way relationship, and which are least important. Associations with brands, products or services found in cognitive mapping can also help to inform marketing. Through using cognitive mapping, we can start to understand which concepts and associations are linked to the brand or service in question, which can provide avenues through which to direct marketing efforts. A simple example of this could be the strong association between ‘market research’ and ‘reliable’ in Figure 1. If this cognitive map was for the marketing team of a market research agency, we could recommend that marketing efforts should focus on how reliable the company is, as this is what people associate with the service. We could also recommend that marketing efforts should be targeted at B2B companies, as this association was also strong. Through the use of cognitive mapping, we have access to the thoughts and perceptions of customers, prospects and stakeholders, which is key as the aim is to understand and explore the people using products or services. Developing a cognitive map for each subgroup of buyers will allow us to clearly visualise their needs and associations, and the differing strength of associations between groups, which would otherwise be immeasurable. In using cognitive mapping to understand the needs of different groups, we can more accurately target marketing and products towards each group. To use an example, customers of a business selling paving slabs might differ. Whilst price might be important to both business owners and specifiers, the strength of this association might differ. In this case it might be most important to business owners, so that they can maximise profit. If we had just asked a quantitative question about the importance of price, we would likely not have gathered the level of granularity that we can see in the cognitive map. The cognitive map for these personas might differ as below in Figure 2. Cognitive maps are not very widely-used in B2B market research, though offer granular qualitative information that can be used in a variety of ways. Importantly, the cognitive map can be used as a basis for further research, as it can provide strong themes and avenues to explore. Used effectively in conjunction with quantitative validation, cognitive maps can add a level of depth to B2B research which might otherwise be missed.